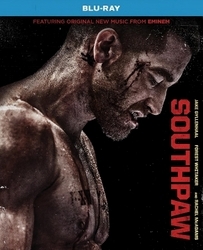 From acclaimed director Antoine Fuqua (Training Day) and starring Academy Award nominated Jake Gyllenhaal (Brokeback Mountain, End Of Watch) comes a story of tragedy, loss and the painful road to redemption... Billy "The Great" Hope (Gyllenhaal) is the reigning Junior Middleweight Champion whose unorthodox stance, the so-called "Southpaw," consists of an ineloquent, though brutal, display of offensive fighting... one fueled by his own feelings of inadequacy and a desperate need for love, money and fame. With a beautiful family, home and financial security, Billy is on top both in and out of the ring until a tragic accident leaves his wife dead and sends him into a downward spiral. His days now an endless haze of alcohol and prescription drugs, his daughter taken by Child Services and his home repossessed by the bank, Billy's fate is all but sealed until a washed up former boxer named Tick agrees to take the bereaved pugilist under his wing so long as he agrees to his strict ethos. Relentless and utterly committed to a fighter that thinks as much as he throws punches, Tick rebuilds Billy into a new man: one that is agile, fearsome and uncompromising in the ring while thoughtful, loving and disciplined outside of it. Now, as he works to regain custody of his daughter and mounts a professional comeback, Billy must face his demons head-on as he learns that, sometimes, your greatest opponent can be yourself.